NanoScope Services offers 3 high end services in sample preparation and Analysis. Focused Ion Beam (FIB) provides many possibilities for preparing sections not possible using more conventional mechanical polishing or sectioning methods. Ion Beam imaging may be done with secondary electrons or ions and offers greater materials contrast than SEM imaging. Unlike electrons, the information comes from the top few nm’s of the sample, and resolutions are comparable at 5nm’s or less. For a detailed description of the equipment and techniques available, go to the Tools and Techniques page. FIB prepared Micro Cross-sections with SE/SI imaging. 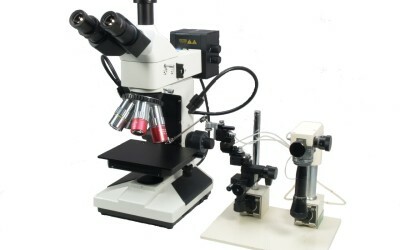 A FIB microscope can precisely locate and section any feature on a sample and directly take images of it. Multiple slices (even with different orientations) can be taken through the same feature to provide 3D information. It is ECONOMICAL, EASY and FAST. Preparing a conventional mechanical section through a complex material takes time. FIB is efficient, versatile and cost effective, with samples processed quickly and the images emailed directly to you. EXACT LOCATION and ORIENTATION – a FIB micro section may be prepared at a very precise location on the specimen surface. This can be through a specific feature or failure, interface or particle, even a crack or void. The orientation of the section may also be defined. Multiple sections may be taken through the same feature or in very close proximity, with each one being uniquely positioned and orientated as desired. MATERIALS INDEPENDENT – The FIB process is largely independent of materials hardness or structure. Softer materials do not smear, harder materials are polished at similar rates to softer ones, and interfaces are preserved. MINIMAL MECHANICAL PREPARATION is required for FIB processing. If the sample is small enough to be loaded and is clean and vacuum compatible it can be sectioned. FIB Prepared ‘Ultra thin’ TEM sections. This tried and tested process has been used routinely for many years and successfully applied by NanoScope to prepare customers samples from over 200 materials systems. EXACT LOCATION and ORIENTATION – Have your ‘ultra thin’ section prepared from exactly where you would like. Specify the orientation of each section as well. MATERIALS INDEPENDENT – The FIB milling process is largely independent of materials hardness or structure. Complex materials combinations and devices are possible to prepare within a single section. ‘LARGE’ IMAGING AREA – A FIB prepared section tends to be of uniform imaging thickness and quality, allowing information to be collected across the majority of the section area. MINIMAL MECHANICAL PREPARATION. Most samples are immediately acceptable for FIB processing without embedding and slicing or cleaving and grinding. If it is clean and small enough, vacuum compatible and has a flat(ish) top surface it can probably be loaded immediately. A variety of TEM instruments may be used for your high end imaging and analysis requirements. Bright/Dark field imaging with referenced metrology as required. Diffraction patterns taken from your specified points. Elemental Analysis either as points, linescans or maps to identify which materials are present and their locations. For more detailed information about TEM Analysis please contact us. An Ion Beam image of a TEM section machined through a high speed transistor showing grain structure and voiding. An Ion Beam image of a FIB prepared TEM section prior to ex-situ extraction to TEM grid. 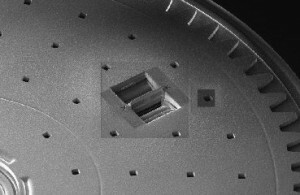 An ion beam image of a site specific TEM section machined through a MEMS cog prior to extraction to grid. The perfect addition to any FIB or FIB-SEM laboratory, a high performance optical microscope with ultra long working distance lenses and an ‘ex-situ’ FIBxTEM section lift-out manipulator. Our new ‘best in class’ configuration maximises the benefits of the ex-situ approach across the widest range of materials systems. Agar Scientific and NanoScope Services sign collaborative agreement to offer advanced TEM sectioning services. If you are interested in working together, send us an inquiry and we will get back to you straight away. NanoScope to present at the 4th Admati Technical Seminar at the Tel Aviv Hilton on 28th April 2015.